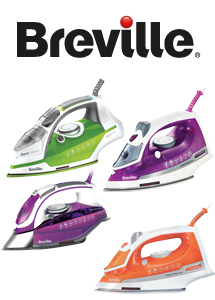 Breville have release four new irons to cater to everyone’s requirements. The SuperSteam Irons and the PressXpress Steam Iron cover all the requirements you may have. Designed to deliver more steam in s compact and lightweight unit. The SuperSteam Iron ranges all include a 250ml tank, anti-scale and 2m-cord length. The PressXpress steam iron has a 400ml tank 3m-cord length and Multi Directional soleplate making it effortless to glide in any direction.